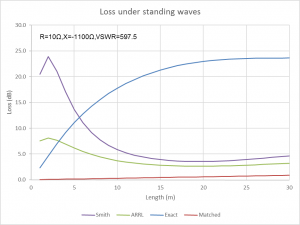 Having recently published Graphic demonstration of loss under standing waves, I was interested in a thread running on QRZ.com which offered solutions to some mismatched scenarios. A far worse condition is using a 40 meter dipole on 80. I spent my entire Novice “career” doing that…with about 100 feet of RG-58! I figured my 50 W from my Johnson Adventurer was down to about 100 mW by the time it got to the antenna. Still worked the world. 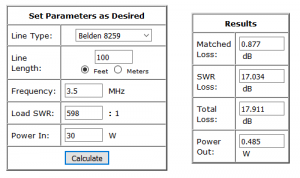 Using http://arrg.us/pages/Loss-Calc.htm with RG-58, 7 MHz, 100 feet of RG-58, 35 watts transmitter power and a load SWR of 25:1 (corresponds to a load Z of 1250 ohms), power at the antenna is about 9 watts. Even with SWR of 50 to 1 the power out is 5 watts. A more exact model of the scenario is a dipole feed point impedance around 10-j1100Ω, and actual VSWR at the load end of the RG58 would be 598, much greater than N2EY’s estimate. Using the calculator recommended by N2EY, but with a VSWR that is more realistic. 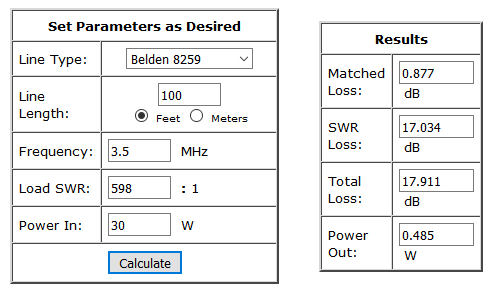 Above, the VSWR based loss calc from N2EY’s recommended calculator gives 0.485W against his working of 9W. That calculator uses the ‘ARRL formula’ discussed at Graphic demonstration of loss under standing waves. Lets try a more exact calculation based on the estimated load impedance. Digging the relevant results out, transmission efficiency is 0.43%, so with 30W transmitter output power, power reaching the feed point is 129mW. So, it turns out the KL7AJ’s suggested 100mW wasn’t far off the mark. Why was N2EY’s calculation of 9W some 70 times or 18dB higher than the more exact calculation? N2EY suggests feed point impedance is 1250Ω and calculates VSWR(50) as 25. They are consistent, and demonstrates that he treats the feed point resistance as purely resistive, or treats feed point impedance as a scalar of value (R^2+X^2)^0.5 (as hams often do). An NEC model suggests feed point Z is around 10-j1100Ω (|Z|=1100.05Ω fwiw), and calculation of VSWR using Zl=10-j1100Ω and Zo=50.02-j1.39Ω gives VSWR=597.53 in the calculator output above. N2EY’s recommended calculator cannot accurately estimate transmission loss using VSWR alone in the general case. It’s estimate of 0.485W using the correct load VSWR is 5.8dB higher than the more exact calculation of 0.129W. Above is a graphic comparison of the methods discussed at Graphic demonstration of loss under standing waves for a range of distances to 30m (~100′). 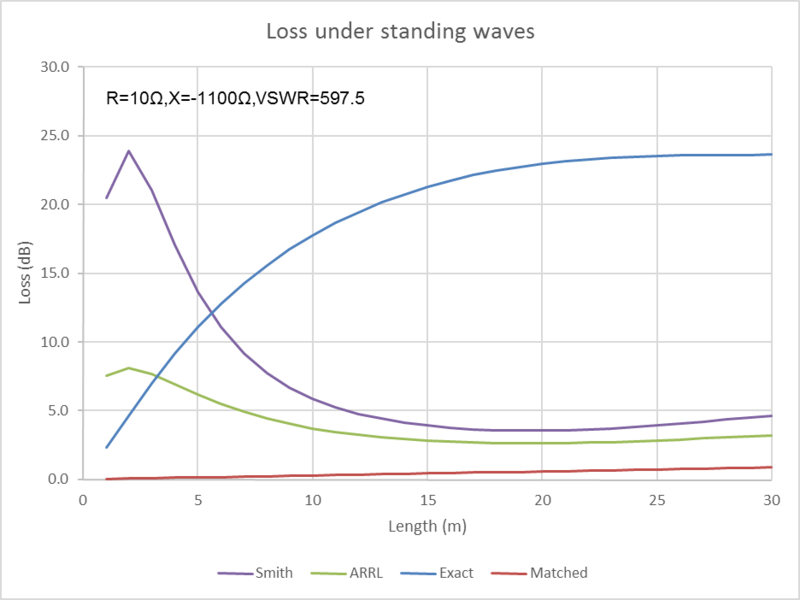 Note that the ARRL conditions their formula as not suited to VSWR>20 which applies to the left of 15m in the above graph.